NEW YORK (Reuters) - Parakeets from Argentina have turned a corner of a New York cemetery into an unlikely home, framed by a grand Gothic arch, that is attracting a growing number of nature and history lovers. Like many immigrants, the bright green Monk parakeets, also known as Quaker parrots, settled into a dark, scary enclave and turned it into a colourful neighbourhood teeming with life even in the dead of winter. 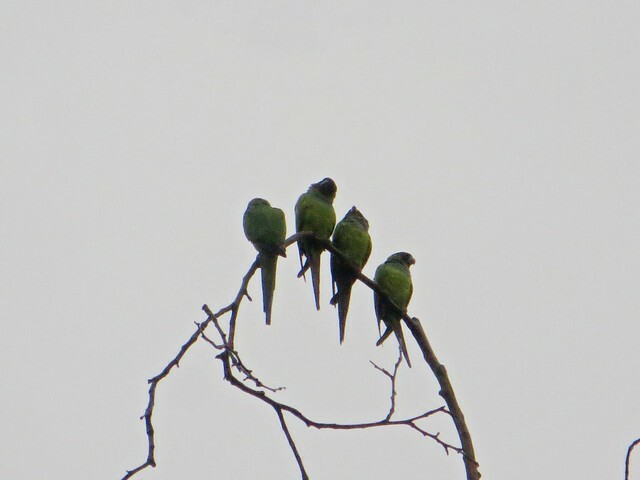 Considered agricultural pests in their native Argentina, the parakeets now nesting near the gateway to Brooklyn’s Green-Wood Cemetery arrived in the 1950s at John F. Kennedy Airport to be sold to the highest bidder, according to popular folklore. Somehow they escaped and sought refuge in a quiet corner where few humans dare to tread, comforting mourners with their loud calls. These include corrupt politician William “Boss” Tweed, toy store founder F.A.O. Schwarz, piano maker Henry Steinway, business tycoons Charles Pfizer and William Colgate, painter Jean-Michel Basquiat and composer Leonard Bernstein. That's interesting. Thanks. I like old cemeteries. 1. There was a fire in a pet store in LA or the SAN Gabriel Valley or the San Fernando Valley. Brave neighbors ran into the burning buildings to release all the animals. 2. An illegal importer found out he was about to be raided and released all his birds before they could bust him. The NYC story is similar. Anyone else live where parrots are non-native and wild? What are your origin stories? There are, as always, two camps here. Those, like me, who thrill to the raucous flocks and those who wish they would just stfu. mr520 camps there. Cemeteries seem like a good place for them. Don’t think the residents mind. Is that Gothic? Or just Goth? I'd say Gothic, with a touch of Simon Rodia and a smidgen of Giacometti. It isn't black so it's just Gothic. They live in Chicago, along the lakefront where it doesn't get too cold in the winter. They've been here for some time. The late Harold Washington was a big fan of them. We had some in my neighborhood when we lived in Honolulu - different species, though. (Rose-ringed parakeets.) There were probably about 20 in the flock. It was always fun watching them chase the cat home. Veronique de Turenne is a regular contributor to L A Observed; she regularly posts pictures (and related stories) taken in Malibu*. Here's a post from last week, Wet parrots in the rain. * Home territory of a noted Fogbower. It looks like a Japanese Ink painting.